Credit booms are addictive. Credit supports growth and the perception of wealth. Yet credit booms are risky, and are often followed by financial busts and economic slowdowns. The challenge is taming credit without hurting growth. Mainland China is experiencing a major credit boom. As of end-2016, total social financing—a broad measure of credit—exceeded 200 percent of GDP. The credit-to-GDP gap—a measure of financial vulnerability—is the second highest among 44 economies covered by BIS (after Hong Kong SAR). How did credit growth contribute to output growth in China? Has credit allocation worsened as the economy became saturated with credit? Can output growth be supported by other means, such as fiscal stimulus? These questions are critical for effective policy making in China today. But answering them rigorously is difficult. This is because credit and fiscal stance not only affect output growth but are also affected by it. Consequently, simple statistical methods may over- or under-estimate the true causal effects of credit or fiscal stance on output. Recent IMF research deals with this challenge using an “instrumental variables” approach. The idea is based on the observation that provincial leaders tend to use more credit and fiscal stimulus later in their tenure independently of local economic conditions—possibly because higher growth outcomes increase the chances of their retention and/or promotion. The results are striking. The paper estimates that, historically, credit indeed supported output growth in China. In 2001-2008, GDP increased by 2 percent in response to a 10-percentage point change in the ratio of credit to initial GDP. However, by 2010-2015, the effect of credit on output growth fell to almost zero. This might be the consequence of the economy becoming saturated with credit, with new credit being allocated inefficiently—for example to overheated housing markets , inefficient state-owned enterprises , or local government financing vehicles . The results suggest that, at present, credit cannot effectively support further growth of the Chinese economy. In contrast, the paper finds that fiscal stimulus may be powerful, assuming it is done correctly. The fiscal multiplier for on-budget expenditure was 1.4 in 2010-2015. In other words, GDP increased by 1.4 percent in response to a 1-percentage point change in the ratio of on-budget expenditure to initial GDP. 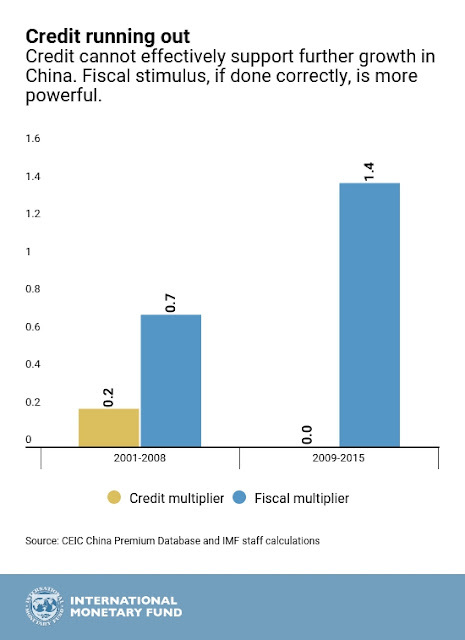 This multiplier is high in international comparison, and is also higher than the historic 0.7 multiplier in China in 2001-2008. Therefore, fiscal policy can effectively support growth in the face of possible shocks, including those caused by lower credit growth . There are three caveats to our analysis. First, the off-budget expenditure fiscal multiplier is likely lower than the on-budget expenditure fiscal multiplier that we estimate. Consequently, the fiscal multiplier for a mix of on- and off-budget expenditure is also lower than our estimates. Future fiscal policy should be on-budget to be most effective. Second, fiscal priorities matter. Historically, much of fiscal stimulus targeted infrastructure and manufacturing-related spending. As the IMF recently suggested , future fiscal stimulus should prioritize social expenditure and transfers, to foster the continued rebalancing of the Chinese economy towards services. Third, credit allocation matters. While the overall effect of credit on growth appears very low, prudent credit to efficient firms remains desirable and growth-supporting. Overall, the results of our analysis support the Chinese authorities' recent efforts toward addressing financial sector risks. These efforts, as well as the potential additional policies aimed at strengthening them, are reviewed in the recently completed IMF's Financial System Stability Assessment for China .